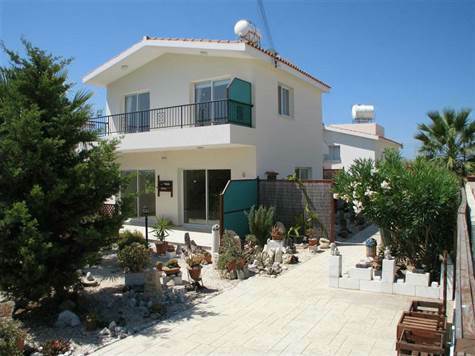 Mandria, Paphos - This is a lovely 3 bedroom family home with larger than average fully landscaped garden in the friendly village on Mandria, Paphos. Mandria village offers a couple taverns / restaurants and mini supermarkets amongst other typical village amenities. It's located about 14km from Paphos, on the coast and just off the Paphos to Limassol highway, so very easy for commuting to either city. The home is situated just a short level walk from the village centre and range of amenities. It is very nicely established with mature colourful gardens in an established neighbourhood. The beach is an easy stroll away and you have sea glimpses from the balcony & upstairs windows. The villa itself is a very spacious open plan ground floor with large lounge / dining area with 2 patio doors onto the full width terrace. The kitchen is a good size and open planned with a breakfast bar. Also on the ground floor is a useful cloakroom / guest WC. To the first floor are 3 double bedrooms, each with built in wardrobes and provision for air conditioning. The master bedroom has an en-suite shower room and there is a family bathroom. The 2 front bedrooms have access onto the large balcony, overlooking the garden with far reaching views. The house is set back from the road on an extremely private plot that has space for a swimming pool if desired. The property is offered for sale with immediate vacant possession and has FULL TITLE DEEDS.